The dust is settling after the 11th RS Feva World Championships in the beautiful Gulf of Mexico as 102 sailors have left Clearwater with fantastic memories, new friends and a week's worth of Florida tan. Since the RS Feva’s involvement in the Americas Cup Endeavour Regatta, the RS Feva Class has gone from strength to strength, with the class booming across Europe, North America, China, and New Zealand. Clearwater didn’t disappoint with varied conditions across the week providing challenging sailing for all competitors. With crystal blue waters, white sands and near-perfect weather, which delivered every wind type we could wish for, perfect for crowning the RS Feva World Champions. Sailors had to perform in a mixture of conditions, which included showing a masterclass in big wind sailing on ‘Super Saturday’ when the weather gods treated the fleet to some epic windy condition. Looking ahead to the RS Feva World Championships in 2019, will be hosted by Club Velico Castiglione della Pescaia from the 21st – 26th July 2019. Castiglione della Pescaia, is an ancient seaside town in the province of Grosseto, in Tuscany, Italy. The town is steeped in Italian culture and boasts stunning beaches, crystal blue coastlines, a vibrant town and majestic architecture. Please follow the championships on the RS Feva Facebook page or a www.rsfeva.org. 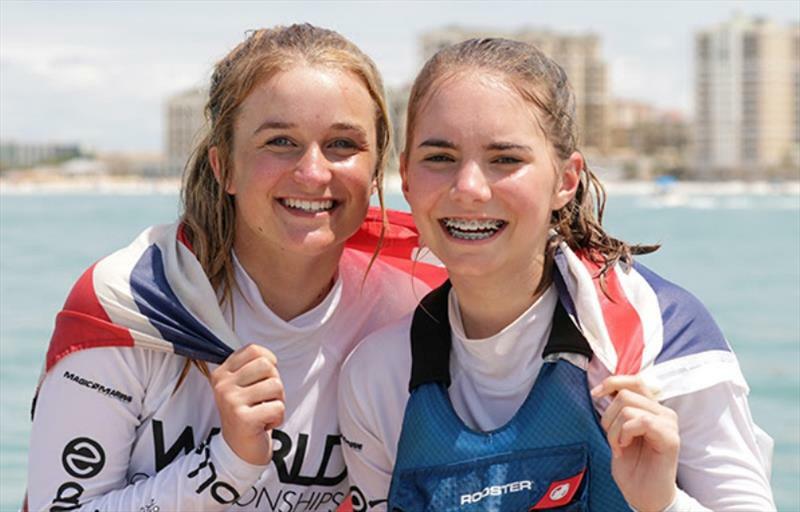 When the International RS Feva Class took the leap to host the World Championships across the pond, the search was on for a venue that would deliver fantastic sailing conditions, amazing atmosphere, fantastic weather and a whole pile of RS Feva fun. Clearwater, Florida was chosen and Clearwater delivered on all counts. The sailors have had a fabulous time and judging by some of the stories in the dinghy park, so did the partners and coaches. On the last day of racing there were four points separating the top two boats and clearly both teams were nervous as the fleet headed out under the bridge into the gulf. The breeze was very light but the PRO was determined to try and get the final races in. The course was laid and the sailors were soon in sequence. As the fleet crossed the line, what breeze there was faded away and within a few minutes of the start the PRO had no choice but to abandon. At 1pm after a lengthy discussion between the PRO and the RS Feva Class the decision was made to abandon for the day as there was no sign of the forecasted breeze. As the flags were hoisted the cheers rung out around the gulf from all the relieved sailors and the celebrations could begin. The RS Feva class had new World Champions, overall and mixed team Ben Hunton-Penman and Abi Jayasekara, Ladies Annie Hammett and Emma Wells, Boys Tom Storey and Rupert Jameson, Junior Femme Rijk and Silke Zuidema and the family title going to William Caiger and Becky Caiger. It is amazing to see the strength of the RS Feva Fleet worldwide with five nations represented in the top ten. Ben and Abbey absolutely deserved their title. The USA Team Dieter and Conrad also sailed an outstanding week – tough competition and only two points between first and second. Annie and Emma will be known as the comeback girls. Down and out after day 1 fought it right back to Ladies World Champions. The boys sailed extremely well. Tom and Rupert only just missed out on overall title so extremely worthy winners of the Boys title. The Dutch team Hanna and Bente were absolutely the stars of the show on 'Super Saturday' posting top 5 results all day. The Vanhang Sailing Team from China have certainly come a long way since the Worlds In Medemblik last year and all of these sailors will be ones to watch in future years. It's always lovely to see family teams enter the Worlds and we think it's quite unique. The Chinese girls are actually twin sisters, which make them the second set of twins the RS Feva Worlds has seen enter. The class has so many to thank, from Clearwater Community Sailing Centre for being the perfect hosts, to event organisers Red Gear Racing who worked so hard to deliver an amazing Championships, the PRO – Paul Uliberry and his team for setting great courses to enable world class racing. RS Sailing for providing 51 charter boats to get the 102 sailors from 11 nations on the water and the class sponsors PA Consulting Group and Allen Performance Hardware.